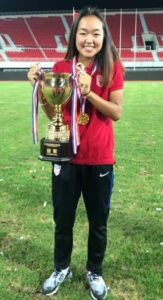 It was another big month of soccer for Placer United’s 2003 player Kellie Pagador as she added another International trophy to her cabinet by helping the US Women’s U15 (2003) National team win the CFA International Women’s Youth Football Tournament in Weifang China. Kellie who won her first International trophy with the Women’s U16 (2002) National team earlier this year in Italy played in all three games in China, which included the game of the tournament against Japan as the U.S. team came back from a two goal deficit to win 3-2. Upon returning from China, Kellie was packing her bags again as she received an invite to the U16/U17 Women’s National team training camp at the Elite Athlete Training Center in Chula Visa, Calif. as they. prepare for the U17 Women’s World Cup in Uruguay.